A Miami Beach Police detective continues to fight for the life of his teenaged son who was hospitalized after his heart stopped beating due to a viral infection. 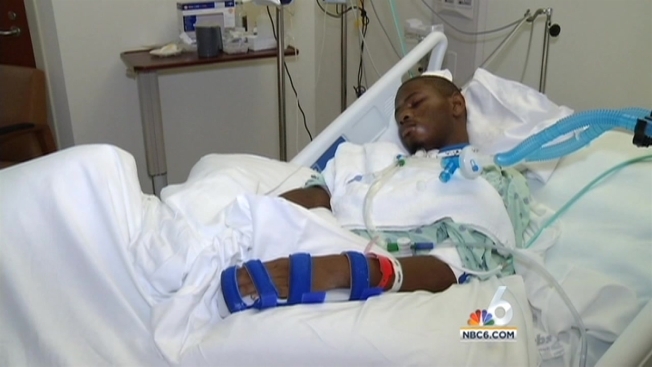 Dwayne Mitchell, 18, a senior at G. Holmes Braddock High School has been in a coma and clinging to life for 45 days. He was at his grandmother's house when he coughed and suddenly went into cardiac arrest. "You wanna try and open your eyes just a little bit for me today?" Detective Christopher Mitchell asked as his in his hospital bed. "He's still fighting for second chance at life. There have been a lot of improvements since then," Mitchell said. The teen had a viral infection and a rare and little known heart disease called Wolff-Parkinson-White. If not caught early, it could lead to this. "Unfortunately he was down for a while, there's a lack of oxygen and blood going to the brain cells and he sustained severe brain swelling," Mitchell said. Surrounded by family photos and well wishes from friends and family, Dwayne relies on machines to breathe and eat. He requires life support at Least 19 hours a day. "They're watching pretty closely. Sometimes it's really scary for me because I don't know when you take them off if I'm going to lose him all together," Mitchell said. Mitchell says the family is trying to get the best medical care they can for his son but the cost of treatment is far exceeding what their insurance can cover. The family estimates Dwayne's treatment and rehabilitation will run about a half million dollars. Their insurance covers a little more than half of that. The family has set up a GoFundMe page. If you would like to help out, click here. And for more information about Wolff-Parkinson-White disease, click here.